Market Monetarists have a tendency not to get all worked up about fiscal issues. I guess the same goes for the discussion about a possible US government shutdown. But what is history telling us? Well, it would not be the first time we would have a US government shutdown. Last time it happened was in 1995. The United States federal government shutdown of 1995 and 1996 was the result of conflicts between Democratic President Bill Clinton and the Republican Congress over funding for Medicare, education, the environment, and public health in the 1996 federal budget. The government shut down after Clinton vetoed the spending bill the Republican Party-controlled Congress sent him. The federal government of the United States put non-essential government workers on furlough and suspended non-essential services from November 14 through November 19, 1995 and from December 16, 1995 to January 6, 1996, for a total of 28 days. The major players were President Clinton and Speaker of the U.S. House of Representatives Newt Gingrich. …A 2010 Congressional Research Service report summarized other details of the 1995-1996 government shutdowns, indicating the shutdown impacted all sectors of the economy. Health and welfare services for military veterans were curtailed; the Centers for Disease Control and Prevention stopped disease surveillance; new clinical research patients were not accepted at the National Institutes of Health; and toxic waste clean-up work at 609 sites was halted. Other impacts included: the closure of 368 National Park sites resulted in the loss of some seven million visitors; 200,000 applications for passports and 20,000 to 30,000 applications for visas by foreigners went unprocessed each day; U.S. tourism and airline industries incurred millions of dollars in losses; more than 20% of federal contracts, representing $3.7 billion in spending, were affected adversely. It sounds pretty horrible doesn’t it? 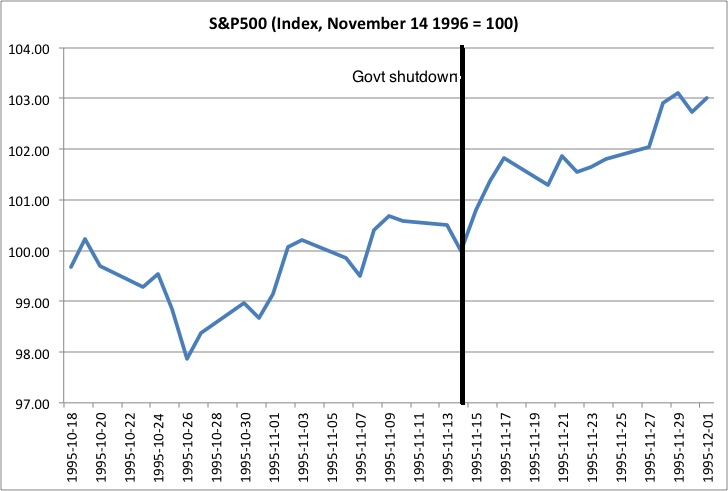 But now look at how the US stock market performed ahead of, during and after the 1995 government shutdown. Are you scared? I am not. If the stock market is up it is normally a pretty good indication that no permanent damage has been done to the economy. PS If you do not get why I am not scared about this you should take a look at what I said about the “fiscal cliff” a year ago – See for example here. It is all about a rule based monetary policy and the Sumner Critique. The Cato Institute and Fraser Institute have published their annual report on Economic Freedom of the World. As always it is interesting stuff. One can of course always debate the methods used to rank different countries in Economic Freedom ranking, but I nonetheless think it gives a pretty fair description of the overall tendencies. One thing I always like to look at is the relative ranking of the Nordic countries versus the US. Interestingly enough all of the Nordic countries tend to rank as very economically free in both the Cato/Fraser rankings and in the similar ranking from the Heritage Foundation. This is despite the fact that the Nordic countries have very large public sectors and a high level of taxation. However, that is generally more than “compensated” by low levels product and labour market regulation and very open economies with free movement of capital and goods. So there you go – both Denmark and Finland are more economically free than the US at least according to Cato/Fraser. I sure that a lot of Danish libertarians and conservatives would object to Denmark high ranking and they would undoubtedly stress that it is impossible to argue Denmark is more “economically free” than the US due to the fact that the Danish public sector is among the largest public sectors in the world and level of taxation is very high in Denmark. However, looking in all other areas Denmark is indeed a very free economy. I am looking forward to comments from both Danes and Americans. Is Fraser and Cato right? There is more good news from Japan today as new data shows that core inflation rose to 0.8% y/y in August and I think it is now pretty clear that the Bank of Japan is succeeding in defeating 15 years’ of deflation. Good job Mr. Kuroda! Franklin D. Roosevelt was elected President of the United States in 1932 with the mandate to get the country out of the Depression. In the end, the most effective actions he took were the same that Japan needs to take—- namely, rehabilitation of the banking system and devaluation of the currency to promote monetary easing. But Roosevelt’s specific policy actions were, I think, less important than his willingness to be aggressive and to experiment—-in short, to do whatever was necessary to get the country moving again. Many of his policies did not work as intended, but in the end FDR deserves great credit for having the courage to abandon failed paradigms and to do what needed to be done. Japan is not in a Great Depression by any means, but its economy has operated below potential for nearly a decade. Nor is it by any means clear that recovery is imminent. Policy options exist that could greatly reduce these losses. Why isn’t more happening? To this outsider, at least, Japanese monetary policy seems paralyzed, with a paralysis that is largely self-induced. Most striking is the apparent unwillingness of the monetary authorities to experiment, to try anything that isn’t absolutely guaranteed to work. Perhaps it’s time for some Rooseveltian resolve in Japan. So far so good and there is no doubt that governor Kuroda has exactly shown Rooseveltian resolve. However, while Roosevelt undoubtedly was right pushing for monetary easing to end deflation in 1932 he also made the crucial mistake of trying to increase wages. One can say that Roosevelt succeed on the demand side of the economy, but failed miserably on the supply side of the economy. First, Roosevelt push through the catastrophic National Industrial Recovery Act (NIRA) with effectively was an attempt to create a cartel-like labour market structure in the US. After having done a lot of damage NIRA was ruled unconstitutional by the US supreme court in 1935. That helped the US recovery to get underway again, but the Roosevelt administration continued to push for increasing labour unions’ powers – for example with the Wagner Act from 1935. While it is commonly accepted that US monetary policy was prematurely tightened in 1937 and that sent the US economy into the recession in the depression in 1937 it less well-recognized that the Roosevelt administration’s militant efforts to increase the unions’ powers led to a sharp increase in labour market conflicts in 1936-37. That in my view was nearly as important for the downturn i the US economy in 1937 as the premature monetary tightening. The “logic” behind Roosevelt’s push for higher was that if inflation was increased then that would reduce real wages, which would cut consumption growth. This is obviously the most naive form of krypto-keynesianism, but it was unfortunately a widespread view within the Roosevelt administration, which led Roosevelt to push for policies, which seriously prolonged the Great Depression in the US. It unfortunately looks like Prime Minister Abe in Japan is now pushing for exactly the same failed wage policies as Roosevelt did during the Great Depression. That could seriously undermine the success of Abenomics. This is exactly what Roosevelt tried to do – and unfortunately succeed doing. His policies was a massive negative supply shock to the US economy, which pushed wages up relatively what would have happened with out policies such as NIRA. The result was to prolong the depression and I am fearful that if Prime Minister Abe will be as successful in pushing for higher wage growth in Japan it will undermine the positive effective of Mr. Kuroda’s monetary easing – inflation will rise, but economic growth will stagnate. What Prime Minister Abe is trying to do can be illustrated in a simple AS-AD framework. 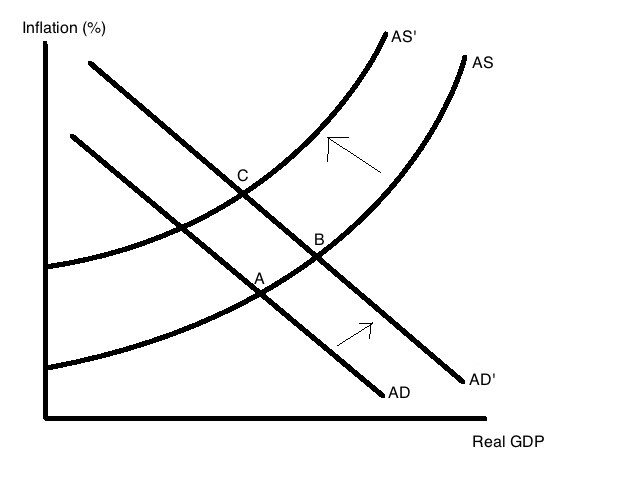 Mr. Kuroda’s monetary easing is clearly increasing aggregate demand in the Japanese economy pushing the AD curve to the right (from A to B). The result is higher inflation and higher real GDP growth. This is what we are now clearly seeing. However, Prime Minister Abe’s attempt of increasing wages can only be seen as negative supply shock, which if successful will push the AS curve to the left (from B to C). There is no doubt that the join efforts of Mr. Kuroda and Mr. Abe are pushing up inflation. However, the net result on real GDP growth and employment is uncertain. I am hopeful that Mr. Abe is not really serious about pushing up wages – other than what is the natural and desirable consequence of higher demand growth – and I hope that he will instead push much harder to implement his “third arrow”, which of course is structural reforms. Said, in another way Mr. Abe should try to push the AS curve to the right instead of to the left – then Abenomics will not repeat the failures of the New Deal. A couple of days ago I came across an article from Bloomberg, which I think is very telling about everything which is wrong about the recent hype about macroprudential policies. When Katja Taipalus came home from school every day in the Finnish town of Jalasjaervi, she knew her working parents wouldn’t be there. Instead, her retired grandfather, who also lived in the large wooden house, played cards and other games with her. They even repaired a car. Those discussions taught her to stay focused when she became an economist and her research hit a dead end, she says. The end result: an indicator that helps detect asset-price bubbles in equity and housing markets — as much as a year in advance. Drawing up the indicator earned Taipalus her Ph.D. last year at the University of Turku, after four-and-a-half years of study alongside full-time work at the Finnish central bank. She heads the macroprudential-analysis division of the financial-stability and statistics department, running a team of seven economists and experts who work on analysis and applied research. I don’t know anything about Ms. Taipalus’ private wealth, but if this is true she have to be a very wealthy person indeed. If you are able to build such a model you should be able to make enormous profits. But the truth is of course that you cannot really build a model that can do this. Economists, speculators and charlatans have tried to do this as long as we have had financial markets and the truth is that nobody consistently is able to beat the market. Yes, we might find indicators and models that might historically have worked, but the point is that once these model or indicators becomes known they will breakdown as everybody would start to use them. This is the case of stock markets and it is the the case in the baseball market (See here why Oakland A’s stopped winning). You might think that this is Econ 101, but nowadays central bankers increasingly think they can beat the markets. This is at the core of macroprudential thinking. Central bankers will design models and indicators to spot bubbles and imbalances in the economy and use these models to counteract “excesses” in the financial sector by increasing for example capital and liquidity ratios. I personally find the theoretical and empirical foundation for this extremely flawed. The proponents of macroprudential policies fail to understand the basic truth of Goodhart’s Law – When a measure becomes a target, it ceases to be a good measure. It is that simple. Another very serious flaw in macroprudential thinking is that not only is it assumed that central bankers can beat the market, it is also assumed that central bankers are benevolent dictators who will always do the right thing when they spot a bubble. However, we all know that central bankers are far from all-knowing benevolent dictators – if they were then there would never had been any crisis at all. I certainly did not hear many central bankers who both warned about the risk of crisis prior to 2008 and at the same time initiated policies to avoid the crisis unfolding. In fact I only remember debating numerous central bankers prior to 2008 who all consistently said that everything was just fine. A way to illustrate central bankers abilities to beat the market and use that information to their own advantage is the management of foreign exchange reserves. If central bankers indeed are more clever than market participants then one should expect FX reserves to to yield an higher and less risky return than for example privately managed pension funds. Unfortunately most central banks are not exactly transparent about their ability to manage FX reserves so it is hard to find any good comparison between central bankers and private sector asset mangers abilities to undertake asset allocation. But as far as I can see there is absolutely no evidence that central bank asset managers consistently beat private sector asset managers. A decade-long diversification of official reserves into riskier investments came to an abrupt end at the beginning of the global financial crisis, when many central bank reserve managers started to withdraw their deposits from the banking sector in an apparent flight to quality and safety. We estimate that reserve managers pulled around US$500 billion of deposits and other investments from the banking sector. Although clearly not the main cause, this procyclical investment behavior is likely to have contributed to the funding problems of the banking sector, which required offsetting measures by other central banks such as the Federal Reserve and Eurosystem central banks. The behavior highlights a potential conflict between the reserve management and financial stability mandates of central banks. This paper analyzes reserve managers’ actions during the crisis and draws some lessons for strategic asset allocation of reserves going forward. Concluding, central banks during booms tend to take on more risk – they overweight risky assets – while they during busts tend to reduce risk – underweight risky assets. Hence, central banks consistently act in a procyclical fashion. This is of course is not only bad in terms of ensuring the highest and most stable return at the lowest possible risk, but it also adds to the swings in the economy as the central bank will add liquidity to the financial system during booms and redraw liquidity during crashes. When the crisis hit (in 2008), many central banks withdrew these investments, in some cases rather abruptly, in ways very similar to commercial asset managers. Traditionally very conservative investors, with a low appetite for risk, the crisis response of reserve managers was perhaps unsurprising—and from an individual reserve manager’s perspective even rational—yet the withdrawal of central bank investments also put further pressure on the banking sector when other sources of funding dried up simultaneously and spreads exploded. In some countries, the withdrawal was unavoidable, as reserves were urgently needed for intervention or to finance domestic support measures during the crisis. In most countries, though, reserves were not used, or the amount used was much smaller than the withdrawal of investments from the banking sector. In each case, and certainly in aggregate, reserve managers acted very procyclically, and may well have been in conflict with the more prominent financial stability objectives of the central bank. Through such behavior, reserve managers may have contributed, albeit unintentionally, to the funding problems in some banks, and have forced an even stronger policy response by the authorities in countries issuing a reserve currency. So I remain skeptical about the usefulness of macroprudential policies – in fact I believe that an over-reliance on such policies could lead to an increase in the volatility and fragility of the global financial system rather than the opposite. LARRY Summers is out of the race to succeed Ben Bernanke as Fed chair. After months of debate, with politicians and media picking over Summers’s personality and background, the spotlight has returned to Janet Yellen, deputy Fed chairwoman. Is she now a certainty? Or is another monetary superhero about to emerge? All of this recalls the moment when George Osborne announced that Mark Carney would be governor of the Bank of England. Carney was described by both the chancellor and the media as a superstar. It’s hard to miss the parallel with the hubbub around Gareth Bale’s £85.3m switch to Real Madrid. But it’s a problem when monetary policy becomes viewed as uniquely dependent on a single “personality”. Central bankers should not be seen as star footballers. At best, they are referees. This is partly a problem of job description. What should the governor do? Should he or she fly about, putting out fires as they erupt in the economy? Or should he or she follow clearly defined monetary policy rules? Over the past five years, we have grown increasingly used to the idea of the fire-fighting central banker. Even in 1999, Time magazine described Alan Greenspan, Robert Rubin and Summers as “The Committee to Save the World” for their role in the Asian crisis, the Russian crisis and the collapse of long-term capital management. Summers’s reputation nearly landed him the top job at the Fed. I seldom agree with Joseph Stiglitz on anything, but I agree with him that it would be a bad idea to name Larrry Summers new Fed chairman. So both Stiglitz and I should be happy today as Summers has redrawn his candidacy for new Fed chairman. I am writing to withdraw my name for consideration to be Chairman of the Federal Reserve. and strengthen the middle class. Reserve, the Administration, or ultimately, the interests of the nation’s ongoing economic recovery. and your economic team faced upon taking office in 2009. And the market reaction? Well, the US stock market is up, the dollar weaker and yields are lower. Said in another way US monetary conditions are easier today than on Friday. So by redrawning from the Fed race Summers has done more for a “sustaine economic recovery” and more “to promote employment” than by staying in the race. That is not my verdict, but the verdict of the markets. Don’t ever mess with Chuck Norris! 1) Monetary policy is highly potent – also at the Zero Lower Bound. 2) Monetary and fiscal policy should be strictly rule-based. That also goes for financial regulation. 3) The fiscal multiplier is roughly zero if the central bank has an inflation target, an NGDP target or a price level target. 4) Central banks should not be engaged in bailing out countries, banks. companies or individuals. Central banks should not conduct credit policies. Central banks should focus on it’s nominal target. 5) Free markets and the price system work well if monetary policy does not mess up things. 2) Central bankers should not follow rules – neither should the fiscal authorities. Policy makers are all-knowing benevolent dictators. And particularly the next Fed Chairman is very clever. 3) Fiscal policy works great in the hands of clever policy makers like the next Fed chairman. 4) The primary role of central bankers is to be firefighters. They should run around and put out fires started by irresponsible bankers and investors in the private sector. 5) Free market capitalism is inherently unstable and it is the job of the Fed to “correct” the price system. 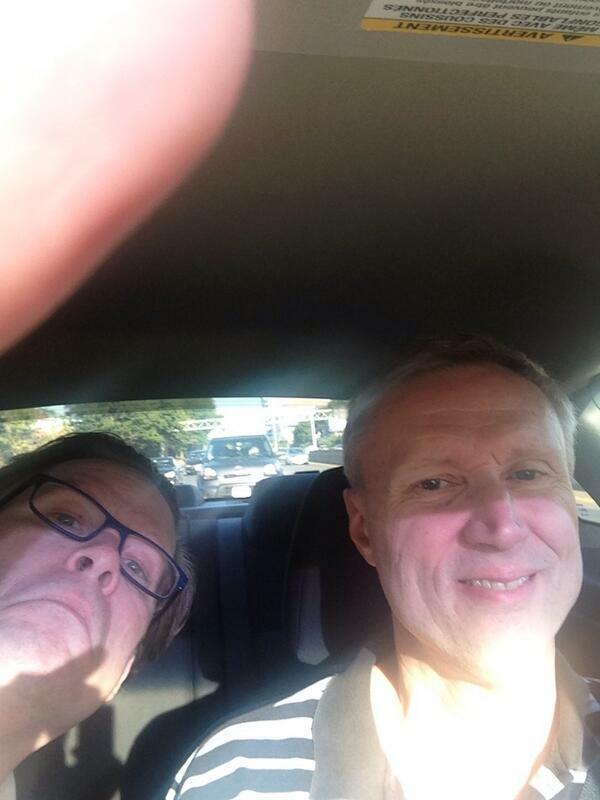 Luckily the Fed chairman is all-knowning.